Sock owl !!! 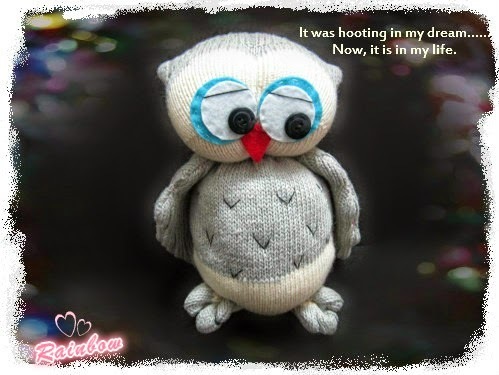 Oh, I have never tried to sew a sock owl ...... Anyway, this should be no problem. 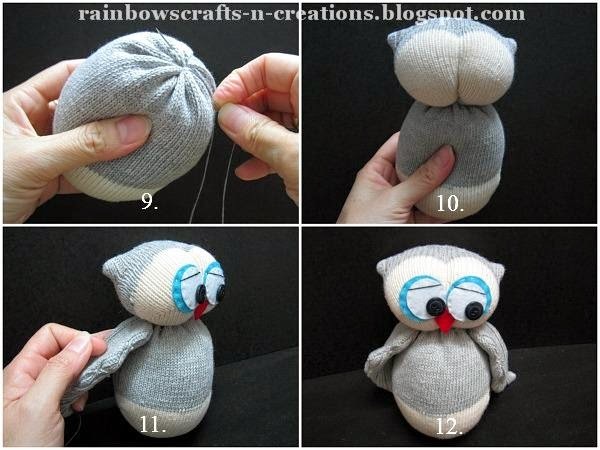 How to make a sock owl? I have some ideas in mind now. Just follow the steps below. 1. Turn the sock to the wrong side with the heel facing up. Draw the parts as shown in the photo. Sew the legs and wings follow the drawing line, leaving an opening at the top of each part. For the head, you just need to sew the upper part without leaving any opening. Now, cut out the body follow the straight line. Then, cut out the head follow the straight line and the sewing line. Remember to keep 1/4'' seam allowance when you cut out the pieces that you have sewn. 2. Turn all the pieces to the right side. 3. Stuff up the head. Run stitches along the raw edge. 4. Fold in the raw edge and pull the thread tightly to close the opening. Cut off the thread. 5. & 6. Insert the needle at the bottom centre of the face (cream-colored area) and come out at the top centre of the head. 7. Once again, insert the needle from the bottom centre of the face and come out at the top, pull the thread tight. Repeat this step two to three times. 8. The result is shown at the photo. 9. Now, stuff the body and close the opening. The steps are the same as making the head. 10. Join the head and the body together with a slip stitch. 11 & 12. Sew the eyes and beak on the face with your felt pieces and buttons. Then sew the the wings to the both sides of the body. Don't stuff the wings, but you need to close up the openings. Just sew the upper part of the wings to the body respectively so that the wings can move freely. 13. & 14. This is the leg part. Start to make the feet now. Insert the needle from the inside and pull the thread through, then insert the needle at the point where 1/4" right above the first insertion point. 15. Pull the thread tight and repeat this step two to there times. 16. Pass the needle to the next with a space as shown in the photo. Pull the thread through. Then, insert the needle at the same point from the back side and pull the thread tight to create toes. Repeat this step two to there times. 17. Close the opening of the leg. 18. 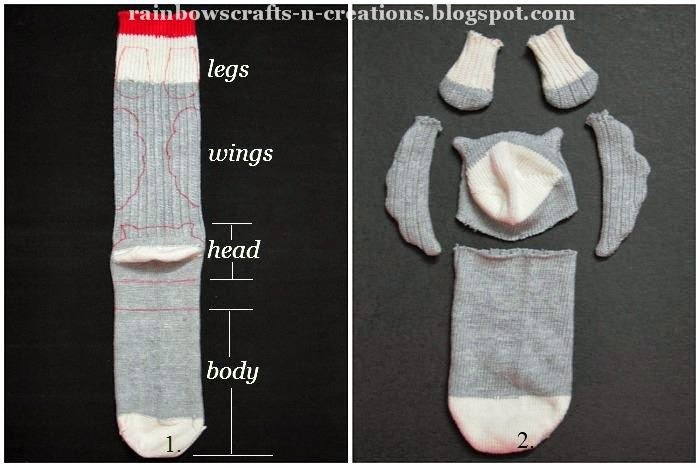 Fold the leg in half and sew both edges together. Don't sew until the feet (grey-colored area). 19. Sew the legs to the bottom of the body part with the joining edges of the legs facing to the bottom. 20. 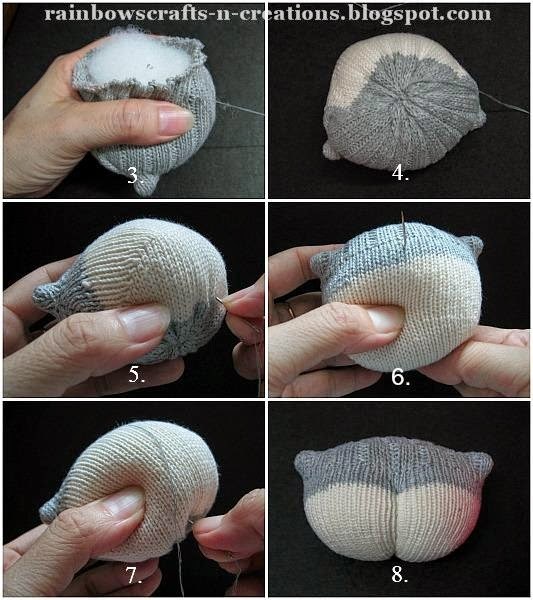 Sew a few "v" shapes to the belly of the owl. Done.